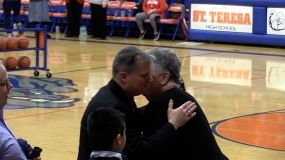 January 29,2019 – St Teresa High School has honored a former head basketball coach by naming the court in his honor. “The Bill Ipsen Court” was named was last night during the halftime of the senior girls basketball game. Bill served as the Head Girls Basketball Coach for seven years, accumulating a record of 162-44 and the 2004 State Championship with an undefeated 33-0 season of which the current Head Coach, Andrea Riebock Dorsey was a member. Following, he served as the Boys Basketball Coach for four years, accumulating a record of 80-35. This naming opportunity was made possible by a generous gift from Jack, Class of 1955, and Barb McCoy. “Bill is the only basketball coach at St. Teresa High School to bring home a State Championship and he is more than deserving to have the court named after him in the Joe Venturi Gymnasium,” stated McCoy.